I have known Bryn for years because we used to work together at Outback Steakhouse (I also met my husband there! You know what they say-theres nothing like a good ol' fried onion to create lasting love and friendships). She is super sweet and we initially bonded over our mutual love for cats :) She also loves horses, and I was SUPER excited when she reached out wanting engagement photos taken with her horse Ruby in the snow. I always love shooting new things, especially when they are as fun and beautiful as this was! The experience did not disappoint! I must say, I'm not much of a cold-weather, winter-loving gal (give me ALL the warmth and sunshine) but I have really been digging the snow this winter and all of the fun and beautiful photo shoots that have come with it! So without further ado, here's some winter wonderland prettiness for your Monday. 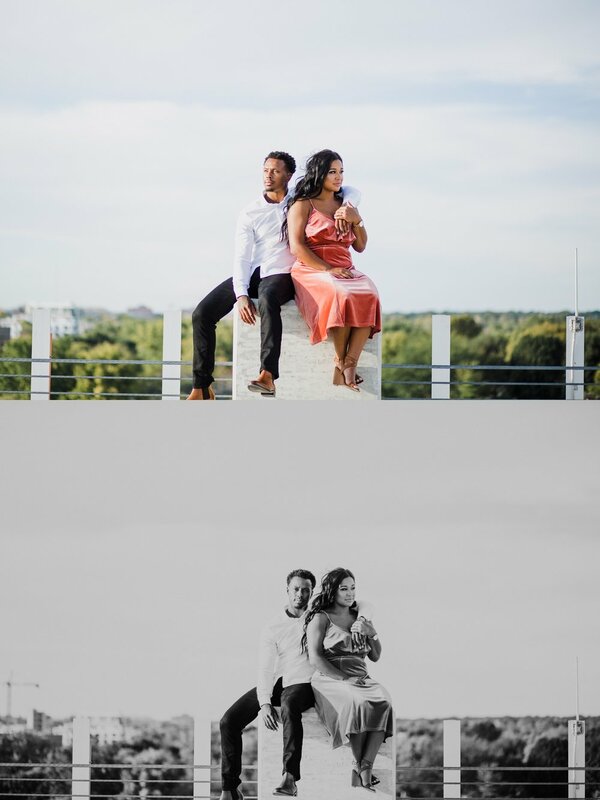 Met these two adorable humans a few months back when they reached out wanting some engagement photos taken. I am glad they did because I had so much fun frolicking around the Hoover Reservoir with them! Hoover is not only my favorite place to shoot, but it's pretty much my favorite place PERIOD! I got engaged AND married right in these woods :) Needless to say I get all the feels when I come here. It couldn't have been a more beautiful fall day for Sara and Shawn's session. It was nice and warm and we had the most beautiful golden sunset to play in. They were so sweet and fun and Sara had such a heart-warming smile! I was so bummed to find out that I am already booked on their wedding date, but it was such a pleasure to get to meet them during such a happy time in their lives and capture these moments for them. Whichever photographer has the pleasure of photographing their wedding this summer is very lucky! Enjoy all of the happy golden sunshiny goodness! Happy Friday friends! I first met with Kristine over the summer and after I heard her describe her and Brandon's relationship I was so excited to see them together. They are the perfect combination of playful and romantic! 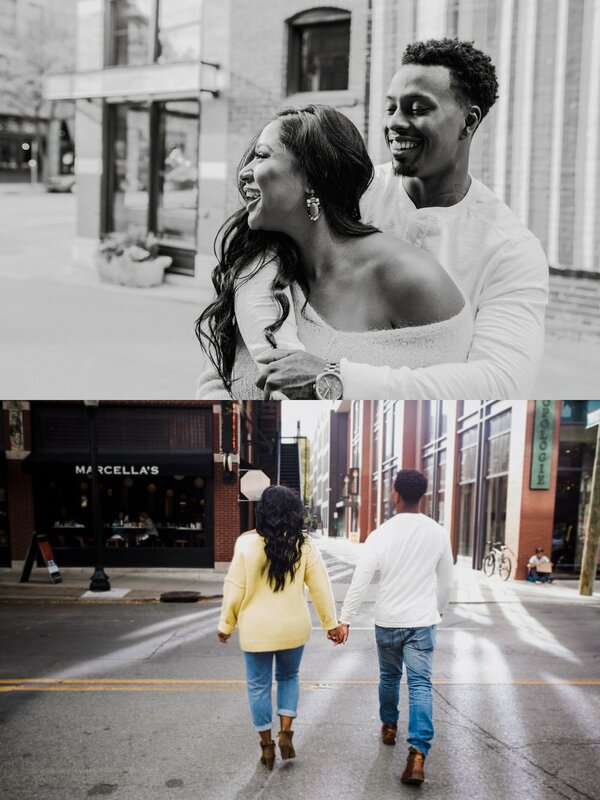 It's super sweet to watch and I loved every minute of capturing it during their engagement shoot! The day of their shoot we met up at Short North Tavern and grabbed a couple drinks before heading out and about. Kristine told me that they were both a bit nervous but I knew they were going to ROCK their photos. When couples are so obviously into each other the way these two are it definitely shows. I was BEYOND right-they were such naturals! I barely had to guide them at all-they just started being insanely adorable and I just took pictures of it! We started around the heart of Short North and ended just before sunset on a nearby rooftop with an awesome view of the Columbus skyline. It was ah-mazing. (Just wait until you see her dress she wore for this!!!) I love this couple and am already so pumped for their wedding next August!! After having coffee with Karlie and Evan and getting to know a little about them I was beyond excited when they chose me as their wedding photographer. These two recently moved to Ohio from California and are loving their life here. When Karlie was describing her visions for her wedding and what she likes, it could have been me talking! They are getting married next summer at the Grand Barn at the Mohicans and I cannot wait. That is definitely one of my favorite wedding venues and having the privilege of photographing this sweet couple there is going to be a amazing! These two were ready to rock and roll for their engagement photos. They showed up willing and ready to climb rocks, walk through streams, and everything in between! They have two pups that they also brought along and oh my GOSH. They wore bow ties and suspenders with little doggie jean shorts and I don't think I've ever seen anything so dang cute in my life. This was a fun session from beginning to end to say the least! Lauren & Eric-two super kind people, one super adorable couple! You can't help but just be happy when you're around them. Lauren's smile is so beautiful and SO contagious and I got to see it a lot because Eric knows how to bring it out in her! (You'll see!) I had so much fun running around German Village with them for their engagement session. German Village is my jam. I know it's a lot of people's jam, and thats because it's awesome. It is definitely one of my fave spots in Columbus. Lauren and Eric had never been before so it was awesome to get to show them around! We walked all around the gorgeous neighborhoods taking photos, I took them to the Book Loft (because everyone needs to experience the book store with 32 rooms and requires a map to find your way around), and we ended our evening at Stauf's, one of my favorite coffee shops. 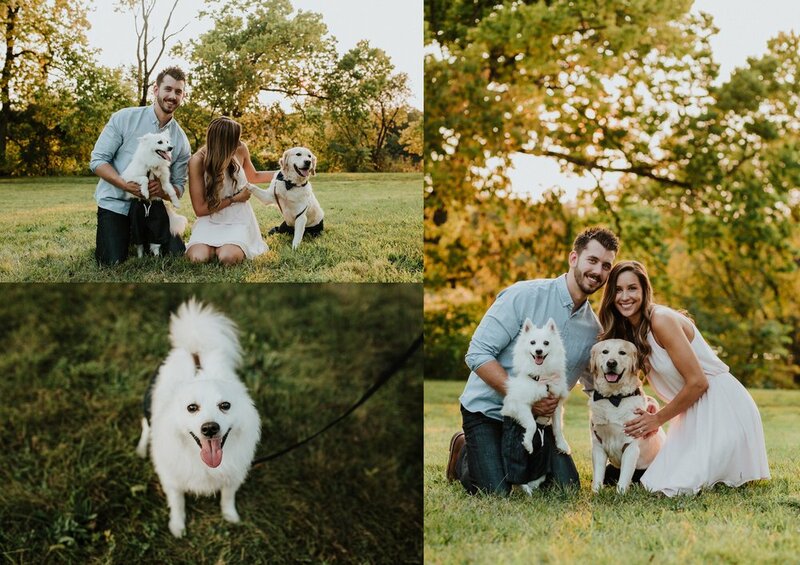 A super fun engagement session indeed! I cannot wait for their wedding at Scioto Reserve next spring! How freaking cute are they?! Seriously! A friend of mine who works at Worthington Jewelers, Kathryn, (seriously the most amazing jeweler in town-defintely make a trip there sometime and look around! SO so pretty) recommended that her friend Nick contact me so I could capture him proposing to his girlfriend. Guys. Listen to me. Girls-go get your boyfriends so they can listen to me. 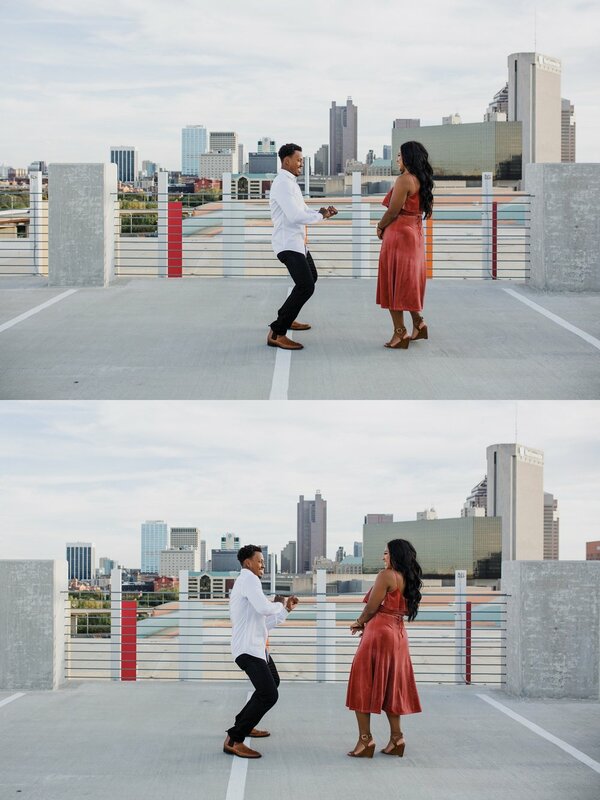 GET A PHOTOGRAPHER TO CAPTURE YOUR PROPOSAL! It will be one of the happiest moment of your life and it goes by SO fast and you both will be so glad you have photos to remember it forever! Anyways, when Nick called me and told me his plan, I could hardly wait! He was going to propose at he and his girlfriend, Sarah's, favorite coffee shop, The Roosevelt Coffeehouse. Ahhh YES!! Not only does Roosevelt have amazing coffee (and stand for many amazing things-check out their website here https://www.rooseveltcoffee.org) but the coffee shop itself is beautiful. Floor to ceiling windows that let in all that good sunlight, beautiful exposed brick...all the heart eyes. I was pumped! When she walked in and saw him, he got down on one knee right there in the middle of the coffee house. It was SO SWEET!!! When she said yes, everyone around cheered :) Needless to say she was very surprised! They both were beaming ear-to-ear all morning. 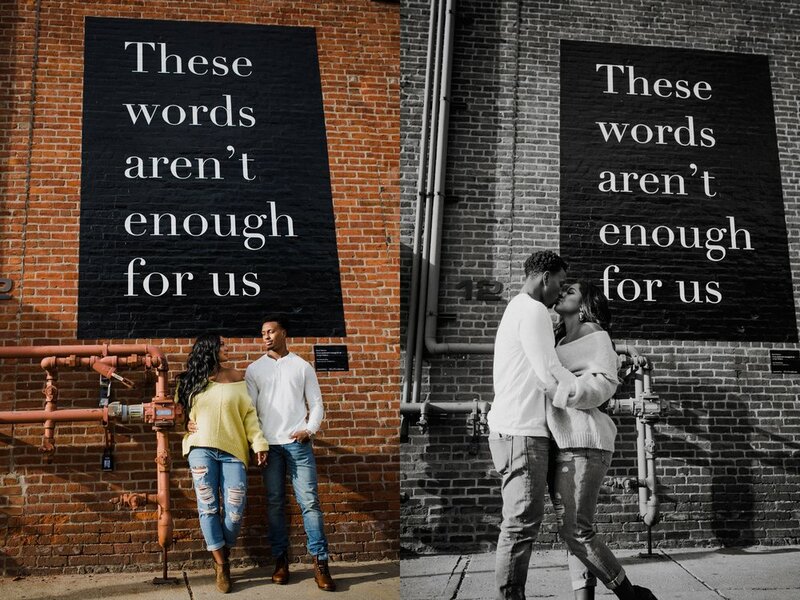 After I gave them a few minutes to process everything and enjoy their moment, I took some engagement photos of them in the coffee shop and outside. It was all so adorable and special. You know when you have a kid and you're just so proud of them and you love them so much because you created them and they're just so dang cute? Well, I don't have kids yet, but I have a camera, and I create photos, and guys....I love them so much! I LOVE what I do SO much. It's literally like Christmas to me after every single shoot. I leave so giddy and I can't wait to run home and load the pictures on my computer. I seriously put so much love into every single photo and I spend most of my time editing with the biggest smile on my face. Knowing that I am creating memories for my clients that they will have forever fills my heart with so much joy. When clients tell me how much they love the photos that I have given them my heart almost explodes. Oh man, that's what it's all about! Martha & Steven thank you for being so sweet and fun! I am really looking forward to your wedding in November!